This would be an easy day with only 15 kilometres to Burgos. It would be strange arriving in a big city again after so much calm and peace in the country of the Montes de Oca. Atapuerca had been a great stop for the night. The village was friendly and alive with visitors, people laughing, and children playing in the streets. As the sun rose that morning, the chill disappeared from the air. 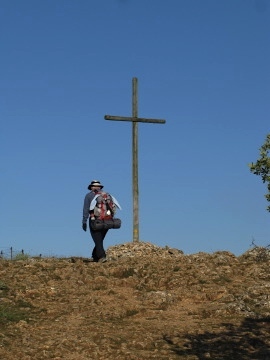 A short climb out of town there was a large cross at the top of the hill. You could just make out the sprawl of Burgos gleeming white in the distance. Near the top I caught up with Bernard and Pascal who I had not seen for a few days. They had stayed in another albergue the night before. We walked together for a while as the rocky path led us slowly down onto the vast plain below. 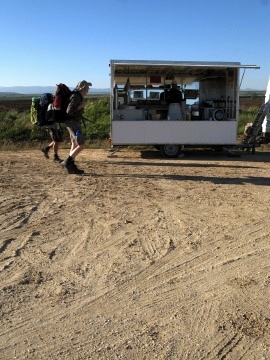 Near a quarry was a van selling pilgrims a hot coffee and breakfast. It appeared out of nowhere and seemed out of place. 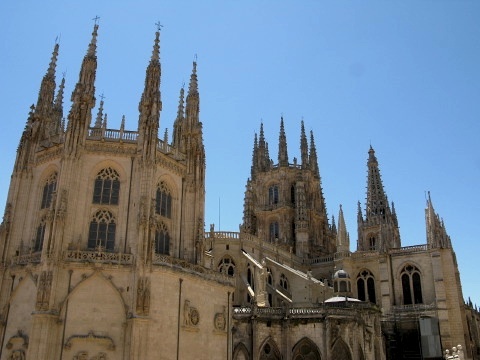 The Camino joined a small quiet road and led through the villages of Cardanuela-Riopico and Orbaneja-Riopico before passing over the motorway that led to Burgos. I had thoughts of stopping when I saw another happy walker tucking into an early lunch. Pascal had gone ahead and with Bernard we found the track that led to the south of the small airport. Bernard frantically tried to contact Pascal on his mobile but he had taken the other route. Our route was supposed to be more picturesque avoiding a large industrial park before Burgos. The wind was still cool as it blew across the open grassland. It was a calming wind. The Camino arrived at the noisy traffic filled outskirts of the city but thankfully soon led to the River Arlanzon where it was a quieter walk to the centre. The outskirts were sprawling and covered in blocks of apartments gleaming in the sun. I became sad again reflecting that perhaps I was always unhappy in cities. The path too was littered with empty plastic water bottles, a scourge of society (don’t buy bottled water!). There was also the return of a dropped tissue every so often. 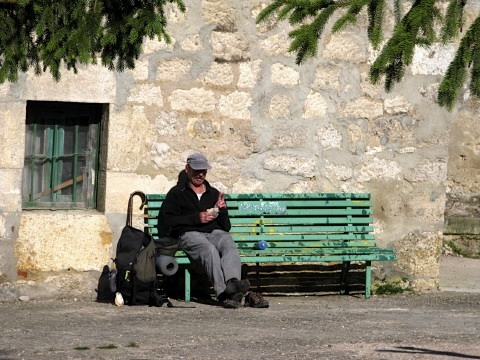 Throughout the Way of Saint James in France each day I had seen two or three tissues lying discarded along the Way. Others had noticed this and were angry that anyone would leave rubbish on this wonderful walk. Maybe I was catching up with the same fantom tissue-dropper! Sadness in a city and anger at pollution were thoughts that streamed through my head. Soon I approached the old centre of Burgos. 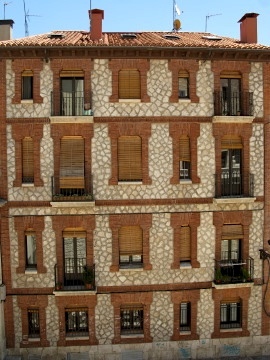 The buildings became more pleasant and after passing through the old town wall, it was a more interesting walk. I had been told that the albergue was near the main cathedral so it was easy to look ahead for the tallest spire. 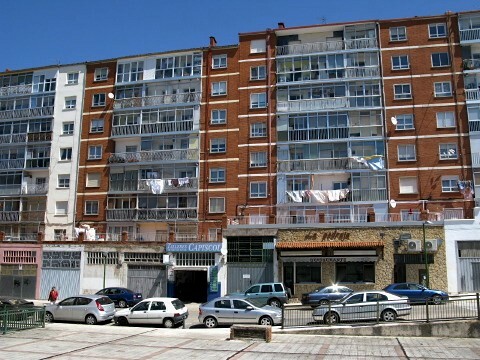 The Casa del Cubo albergue was across the road from this important cathedral and was modern and comfortable. The place was enormous and had all the washing and internet facilities for the pilgrim could desire. It was clean and comfortable too. However the usual early to bed and early to rise rules still existed. One lady was complaining that her bed was too near the toilets. The volunteer in the albergue reminded her that it was not a five star hotel. The day’s washing done, I explored a little of this fascinating centre. It took me a lot of exploring to find a supermarket that was open but eventually I did find one. The sadness returned after dinner as I spend the evening coping with the contrast of nature and the ugly suburbs and the beauty of the cathedral. The mixed emotions of the Camino, like life, had it’s ups and downs. This entry was posted in From the Way and tagged Atapuerca, Burgos, Via Frances, Way of Saint James, Week Seven. Bookmark the permalink. Post a comment or leave a trackback: Trackback URL.